½ kg. chicken,cut into serving pcs. 1 Begin by setting your fire on high heat and get your pan ready. Pour a little bit of oil and throw the onion and half of the ginger. Cook this for 2 minutes before adding the chicken. Continue to cook the chicken until color is not pink anymore. 2 Drop in the sayote and pour the dissolved Knorr Ginataang Gulay Mix and the remaining half of the ginger. Let this simmer for 2 minutes before adding the Knorr Chicken Cubes. Cook this over low heat until the chicken and vegetables are cooked through. Add the siling labuyo. 3 Top the Tinola with dahon ng sili and allow to cook further for another minute before serving. 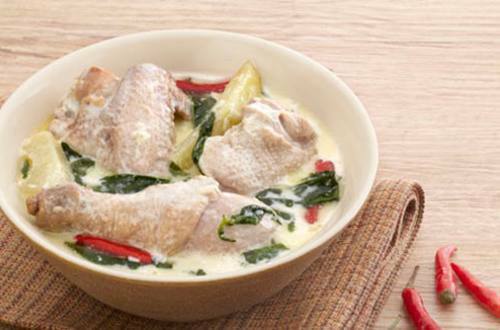 4 Wait until your family tastes this Spicy Tinola. This will definitely awaken their tastebuds.